[Powerful Function] A total power output of power surge protector up to 1100W enables you to power up to 4 appliances and 4 USB powered devices simultaneously. Keep your electronic devices safe from voltage fluctuations, surges, spikes and lightning strikes. [Premium Quality] FCC certified. Built with high-quality components, enhanced circuitry and flame retardant housing, the surge protector wall mount offers up to 1440 joules of surge protection, output over-current protection, over-voltage protection, overheating protection, short circuit protection, and overload protection. 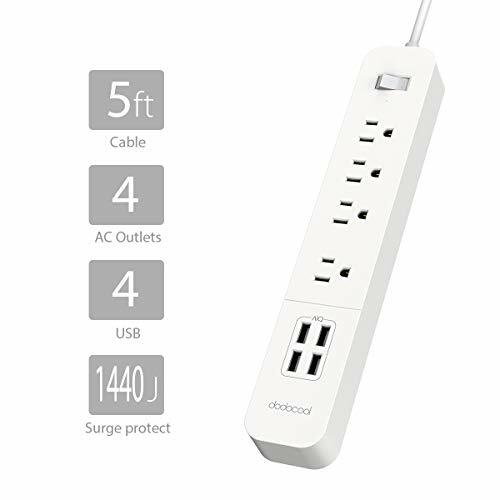 [4 USB Charging Ports] The surge protector with multiplug intelligently deliver the optimal current to USB powered devices, up to 5V/2.4A per USB port and up to 4A in total. Meet Level VI energy efficiency requirements of DOE. [Delicate Design] Compact and space-saving design of this slim surge protector keeps your desk neat and organized. Well-placed outlets enable more convenient plugging and less conflict between plugs. It can accommodate larger power adapters. 2 keyhole slots on the rear of the housing enable it to be mounted on a wall. [Easy to Use] Power on or off several electronics at a push of the power switch. Know the on/off status at a glance of the LED indicator. The 4.92 ft heavy-duty power cord delivers optimal, safe power and enables easy connections to a distant wall outlet. If you have any questions about this product by dodocool, contact us by completing and submitting the form below. If you are looking for a specif part number, please include it with your message.